Whether you are a hunter, or you just enjoy shooting for sport, you know that choosing a scope for your rifle will be one of the biggest factors in determining how accurately you’ll be able to shoot. A scope allows you to zoom in on your target, and precisely lock in exactly where you want your shot to land. There are many scopes on the market from many different reputable manufacturers, so choosing the best one is a daunting task. In the end, the scope you choose will largely come down to personal preference and your shooting needs. This guide will help you figure out what the best scope is to suit your (and your rifle’s) needs. If I had to pick one scope to recommend above all others, especially on a modest budget, the crown would go to the Vortex Diamondback. Vortex is an incredibly popular brand of sporting optics, and for good reason. Their products are very high quality, and generally are in the mid range in terms of price. I like their 4-12×40 model scope personally, as it allows me to zoom in just far enough while still being able to make close up shots by cranking back the zoom. Click here to see its price. Rifle scopes can range from $40 up to thousands of dollars depending on how much one is willing to spend. Depending on what the rifle scope is being used for, you can sometimes get away with or at least get the same results with a cheaper scope that you could do with a higher end one. You should always think about what is economically sound for you to spend on a scope, because a some scopes that are $100 might be all you need, and you can save money by purchasing these scopes instead of getting the highest quality scope that really doesn’t improve your chances anymore than the cheaper one. Below are just a few different scopes that are considered to be the best in their dollar range, but before choosing your scope, you should look at all the details in order to make sure it will provide you with a solution to all of your individual needs. There are a lot of different rifle scopes that you can get for under $100, many of which you probably want to avoid. However the UTG 3-9×32 BugBuster Scope is one of, if not the best in this price range. It offers a lot of quality features, and has a sterling reputation with thousands of online reviews. Mildot reticle with both red and green illumination. Lockable and reset-able turret design. It comes with 3-9x magnification, and the objective lens is 32 millimeters. Included with the scope are a 2″ sun shade, quick release rings, and flip cap covers. While it won’t compare to the Zeiss and Nightforce scopes at the end of this list in terms of optical clarity and quality, this budget scope is perfect for getting the job done with a minimal financial burden. You can buy it on Amazon by clicking here. There are a wide variety of scopes in this price range, including many from well known manufacturers, and it was Nikon that won here. For a price tag that is handily under the $200 mark, the Nikon P-223 3-9x40mm is of exceptional quality. It is designed for rifles chambered in .223 (although it would work for many others as well), and it is made by Nikon, which is one of the best rifle scope brands on the market (as well as optics brands in general). 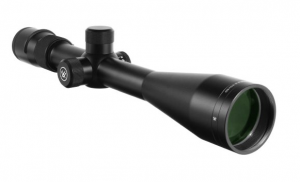 This scope comes with 3-9x magnification, and it has a large 40 millimeter objective lens. 1/4 MOA tactical style hand adjustable turrets with reset functionality. BDC 600 reticle designed specifically for .223 caliber rounds. Nitrogen filled, water and fog proof design. Also in this price range is the Vortex scope I recommended at the top of the article, which you should really consider (especially if you are shooting something other than .223). This scope price range was a little more difficult to narrow down, but in the end, the best rifle scope for under $300 came out to be the Nikon PROSTAFF 5 BDC 3.5-14×40 Rifle Scope. It offers a variety of different features that makes it stand out more so than the others in this particular price range. The average price of this scope before taxes and shipping is around $279, but of course, that depends on where it is you purchase it from. It could be slightly more or even less if you search for a good deal. This rifle comes with 3.5-14x magnification, and it is equipped with a 40 millimeter objective lens. With this rifle scope, adjustments are made extremely easy thanks to its Spring-Loaded Instant Zero Reset Turrets. Thanks to being a Nikon product, which is one of the best rifle brands on the market, this scope is optimized to be used with Nikon’s Spot On Ballistic Match Technology. This scope makes any rifle superior at long range shooting thanks to Nikon’s patented BDC reticle, which has see through ballistic circles. Using this scope on your rifle will make bringing the reticle into focus quick and easy with its quick focus eyepiece. As stated earlier, Nikon is one of the top brands on the market for making high quality rifle scopes, and this particular rifle scope is just one of the mid price range examples of why they made it to the top brand list. You can get more info about this scope here. This category was a hard choice to make. Out of all the different rifle scopes in this price range, I couldn’t narrow down to just one scope, but I was able to narrow it down to the top two rifle scopes for less than $500. The Vortex Viper PA 30mm Tube Rifle Scope – Although this brand didn’t make it in the top rifle scope brands, this particular scope could not be overlooked. It is one of the top rifle scopes on the market today. It has a variety of different aspects that make it this way, and it will surely get the job done efficiently and effectively. On average, this scope is generally anywhere from $448 to $461 depending on where you decide to purchase it. It comes with a one-piece tube that is 30 millimeters, which makes it easier to store without having to worry about loosing any removable parts. It is actually made out of aircraft grade aluminum to guarantee it’s sturdiness. It comes equipped with tall turrets which allows the shooter using it to quickly and easily make any adjustments. There is also a side knob parallax adjustment for versatility. 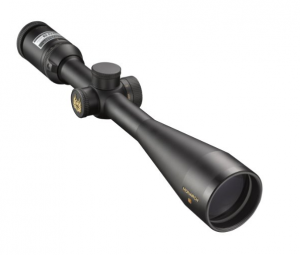 Nikon Monarch 3 4-16x50mm Side Focus Rifle Scope – Once again, Nikon makes the top! This variable scope is by far one of the top rifle scopes on the marketplace today price ranged under $500. On average, the Nikon Monarch 3 runs around $418, but that is mainly determined at where you decide to purchase it from, and that is not including any kind of tax or shipping. Nikon does not disappoint with this scope as it has many of the features that Nikon is known for using on their high end scopes. The Nikon Monarch 3 comes with 4-16x magnification, and it also comes with a larger than normal objective lens. It’s lens is actually 50 millimeters. It is renowned because of its Ultra Clear Coat Optical System which allows up to 95% light transmission. It has a quick focus eyepiece that is meant to allow the shooter to instantly bring their reticle into focus. It’s best feature is the MONARCH 3 Eye Box Technology which allows for a 4 time zoom range. It also allows for a four inch eye relief. This scope is optimized to be used with the Nikon’s Spot On Ballistic Match Technology. Last but not least, it is easily adjusted thanks to its Spring Loaded Instant Zero Reset Turrets. When money is no object, all the rules of the game completely change. A lot of the scopes over $1000 are made by brands that are not seen at the lower budget products. There is a simple answer as to why that is. When most people think of the best brands, they think about the brands that the majority of people who buy a product actually purchase. That is why the higher end rifle scope brands may vary from the over all best and most popular brands. Seeing as this category in finances is so broad, below are two different rifle scopes that can be considered the best rifle scope for those that have an unlimited budget. You should also consider looking at Schmidt & Bender and Swarovski. Zeiss Conquest Rifle scopes 5-25×50 Black Rapid Z 1000 – On average, this particular scope runs around $1100 (Check the current price here). It has a lot of different features, and it is manufactured by Zeiss one of the more popular brands among those that enjoy the high end and expensive rifle scopes. Below are just a few of the many features that makes this rifle scope stick out among all of the other unlimited budget scopes on the market today. This scope comes with a 50 millimeter objective lens, and it comes with 5-25 magnification ability. It is used mainly for hunting anything at long range, including predators, big game, and varmints. It has a robust, one piece tube that is built to stand some of the worst recoils even on extremely demanding terrains. 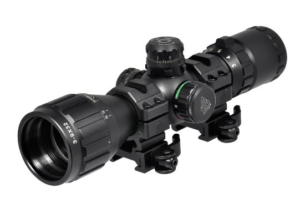 For the rifles that have a harsh recoil, this scope has a 3.5 inch eye relief in order to help protect the shooter’s face from the rifle’s recoil. The Zeiss Conquest rifle scope is one of the most ideal scopes for those that enjoy target shooting on the range. One of the things that helps this be an ideal scope for long range shooting, it offers precision aiming with accurate holdover and wind-corrected information. The lenses of this scope are MC multi-coated, and this help by achieving outstanding brightness regardless of low light situations that might arise on the hunt. 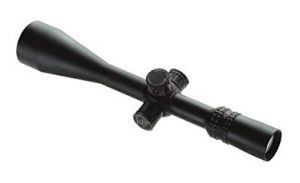 Nightforce NXS Rifle Scope 30mm Tube 5.5-22x 56MM Hi-Speed – The Nightforce NXS Rifle Scope is a high speed scope that could not be ignored for the unlimited budget best category. Nightforce is one of the top brands for professional rifle scopes, and that is why it didn’t make the top brand list. Most Nightforce scopes cost way more than the average person would even think about paying for a sports scope for their rifle. This scope generally runs anywhere from $2,250 to $2,500 (See the current best price by clicking here). Generally, the price depends on where one purchases this scope. Below are just a few of the unique features that this scope has to offer someone. The NXS Rifle Scope comes with 5.5-22x magnification, and it also has a 56 millimeter objective lens. It has a 30 millimeter diameter tube. The eye relief for the NXS Rifle Scope is 3.9 inches. It has finger adjustable turrets and it has a click adjustment. The field of view for this scope at 5.5x magnification is 17.5′, and the field of view at 22x magnification is 4.7′ at 100 yards. 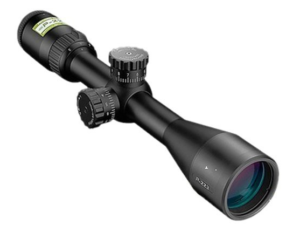 The NXS Rifle Scope has a exit pupil diameter of 10.2 to 2.5 millimeters, and the scope weighs around 32 oz. This scope can be recommended for just about all types of weather, because it is shock proof, water proof, and fog proof. There are a lot of different types of scopes, but they can practically all be placed in two categories. It is important to understand the different types of scopes and the pros and cons to each one before purchasing one. Below are three of the different types of scopes, and they are the most common scopes on the market. 1. Variable Scopes – By far the most common, variable scopes are useful if magnification of the target is needed for a clean shot. With these types of scopes, the shooter can adjust the magnification of the target that they are looking at. These types of scopes come in a variety of magnification variables, and depending on what you are hunting, this could be extremely important. Sniper rifles often use variable scopes, because sniper rifles are used at a much farther distance than a normal hunting rifle. 2. Fixed Scopes – These scopes can be a little less complicated than variable scopes, but they are also only better if people know exactly the specs they need when shooting their gun. You cannot adjust the magnification on fixed scopes like you can on variables. 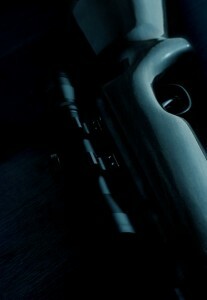 Therefore, these scopes are only recommended in certain occasions and for certain types of firearms. Night Vision Scopes – These are specialty scopes. They can be combined as a variable scope or a fixed scope. What makes these scopes different is the fact that they are used for shooting at night or at times of day when there is a small amount of light to naturally see the target. They are very expensive and bulky, so before choosing a night vision scope, make sure that you actually need to shoot during low light hours of the day. 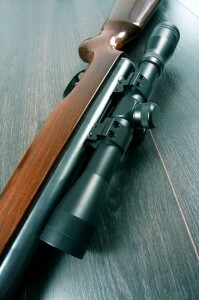 The majority of rifle users want the best scope for their rifle in order to help with whatever it is they are hunting. In the past, the old metallic sights that were placed on rifles were a lot harder to aim with than the newer scopes on the market today. When using a rifle scope, one thing should come to mind: simplicity. The use of a rifle scope has made it a lot easier for the majority of people to be able to line up a kill shot on their target. When using a rifle scope, all you have to do to get a kill on your target is line up your cross hairs or reticles on the target that you are aiming at. Learning to shoot with a rifle scope is an extremely useful skill. Not only is it easier to line up the gun to your target, but it also magnifies your target, making it easier to tell which part of the target you will actually hit. There are a large number of factors that need to go into thought when choosing the right rifle scope. Is bigger and more expensive always better? This can be a tricky question to answer when you are dealing with rifle scopes. The best way to answer this question is this. When you are going to look for your idle rifle scope, you should ask yourself what is it that you are going to be shooting at. In general, if you are a deer hunter, using anything over a 3-9x or 4-12x scope on your rifle would be overkill, and it could actually hinder you in the long run. Those are the average scope sizes for anyone wanting to go hunting, because they offer what is needed for the majority of rifle users. You also need to figure in what kinds of shots you are planning on having to take. If you know that you are going to be shooting far away at your prey, then you will be using a different scope as opposed to shooting at something closer. This has a lot to deal with having the proper magnification on the scope that you choose in order to be able to perform the hunting that you wish to do. What do the Numbers on a Scope tell me? This is a good question to ask. Before you can properly choose a rifle scope, you need to know what the numbers on your scope actually mean. In order to help with this, I am going to reference you to a Nikon M-223 3-12×42 SF rifle scope in order to explain the importance of the numbers on a rifle scope. The numbers when choosing a scope that are important are the 3-12×42. In this particular number, the 3 means that any image that you look at through this scope will appear three times closer to you than it would to the naked eye. The 12 means the same thing. If the scope that you choose has a 12 like this one it means that you can see your target 12 times closer through the scope than with the naked eye. The last number, in this case the 42, is the objective lens diameter in millimeters. If you see a number like this, these scopes are classified as variable scopes. Basically, you can choose if you want your target to be 3 times magnified up to 12 times magnified. In general, the larger the magnification range, the more that particular scope will cost. This is because the wider the range the more versatile that scope will be. Why is eye relief and light transmission important when choosing a scope? A shooter’s age can affect the dilation of their eyes. People who are older will experience smaller dilation than someone of a younger age. An exit pupil is extremely important when choosing your scope. Basically, an exit pupil can be determined by holding a scope out at arms length from you. The small circle of light that appears in the scopes eyepiece when doing this is the exit pupil. The exit pupil is extremely important when thinking about eye relief because the larger the exit pupil is the less important head positioning in relation to the scope becomes. When talking about eye relief in regards to rifle scopes, eye relief is the distance that your eye can be away from the ocular lens of the scope and still provide a full and clear picture of your target. Currently, four inches is the largest eye relief available for any standard rifle scope. If you are using the rifle correctly, four inches in plenty of distance for your face to be out of the way of any recoil your rifle might do. You should always pay attention to the amount of eye relief and exit pupil that a scope offers before purchasing it. What should I look for in a scope in regards to the objective lens size? On most medium variable scopes, the standard object lens size is anywhere from 40 to 44 millimeters. There are objective lenses on the market that are larger, but in most cases these larger lenses are not necessary. As a matter of fact, the larger the objective lens on a rifle scope is, the harder it is to be able to hold your rifle properly. These larger lens also can cause your rifle to be a little less comfortable to shoot due to the fact they can make the rifle feel unbalanced, clumsier, and heavier. Why is Field of View on a rifle scope so important? When speaking about rifles, field of view is generally measure at every 100 yards. What this means is the field of view is the amount that you are actually able to see from right to left at a distance through your scope. When adjusting the magnification of your scope, your field of view will be adjusted. In general, if you decrease the magnification of your scope your field of view will actually increase. This is generally more important with variable scopes, because the difference in magnification can change the field of view drastically. For instance, if you are using a 3-12×42 scope, if the magnification is set to 3 then your field of view will be the full 100 yards. However, if your magnification was turned closer to 12, your field of view would actually decrease down to somewhere around 14 to 10 yards. Just like any other product, there are a lot of different brands and companies that make rifle scopes, but just like with every other product, there are a number of brands that stick out in the market. Below are a list of the top six brands that make rifle scopes, and they all got on this list for a variety of reasons. Some have created special features that make their scopes better in certain aspects, and some brands have an all around aspect to their products that put them on top. A family owned company since its founding in 1907, Leupold & Stevens is without one of the highest quality optic manufacturers in the world. It’s scopes are used by the United States Marine Corps and Navy SEALs, which definitely is a major vote of confidence in their design and manufacturing. They make everything from simple hunting scopes to the incredibly powerful and adjustable tactical designs used by the military. Redfield was purchased by Leupold & Stevens, Inc. back in April of 2008, but they did not acquire any of Redfield’s capability of repairing their products that were made prior to them buying the company. However, Redfield is still currently one of the top manufacturers of rifle scopes on the market. Their motto is “No Excuses”, and they offer a full lifetime warranty to their customers on all of their non-electronic products like their rifle scopes. Sightmark was founded back in 2007, and they have steadily been growing in the modern shooting market thanks to their products and rifle scopes. Currently, they are operated out of Mansfield, Texas, and there motto is “Make Your Mark”. They offer a variety of different products that are ranked top of the market, and they are known for making Triple Duty, Ezekiel, and Pinnacle rifle scopes that excel in performance. Burris considers themselves specialists when it comes to making rifle scopes. They vow that they only employ the most passionate and knowledgeable engineers to manufacture their products. 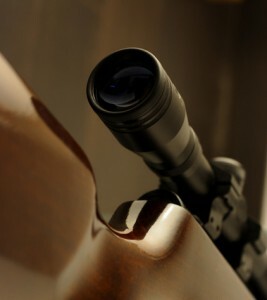 Burris products are not only used by the occasional hunter or sports shooter, but some of their rifle scopes are used by professionals throughout the entire world. Burris is best known for their scopes having lenses with larger diameters than most of their competitors. Bushnell is one of the older popular rifle scope manufacturers with their products still on the market. They have been in business for over 65 years, and they pride themselves on providing only the best quality to their customers. The majority of their products are some of the more reliable and affordable hunting products, like rifle scopes on the market to date. Barska is currently operated out of Pomona, California, which is on the southern end of California. Their priority products all deal with sport optics, and they are considered to be one of the top brands that puts out rifle scopes on the market today. They actually have a global customer base. They have over 40 countries that they distribute their products too outside of the United States. They even offer products that can be individualized for their corporate customers if needed. Nikon is one of the more well known Sports Optics companies in the world. They have a variety of different products that they create, and they are well known in the hunting industry for both their cutting edge hunting optic rifle scopes. Some of their company strengths include their commitment to innovation, quality, and the performance of their products.